June | 2012 | Small Farmers. Big Change. We All Stand With Small Farmers! Banana Producers from the Dominican Republic Say No to Plantations! The following letter was sent to the North American Fair Trade Council by Marike de Pena, Vice President of the Latin American and Caribbean Network of Small Producer Organizations (CLAC). Marike, who is also the Director of BANELINO, a small banana farmer co-op in the Dominican Republic, wrote the Council to express her views about Fair Trade USA’s controversial new certification scheme which allows plantations to become Fair Trade certified under their new initiative, Fair Trade For All. 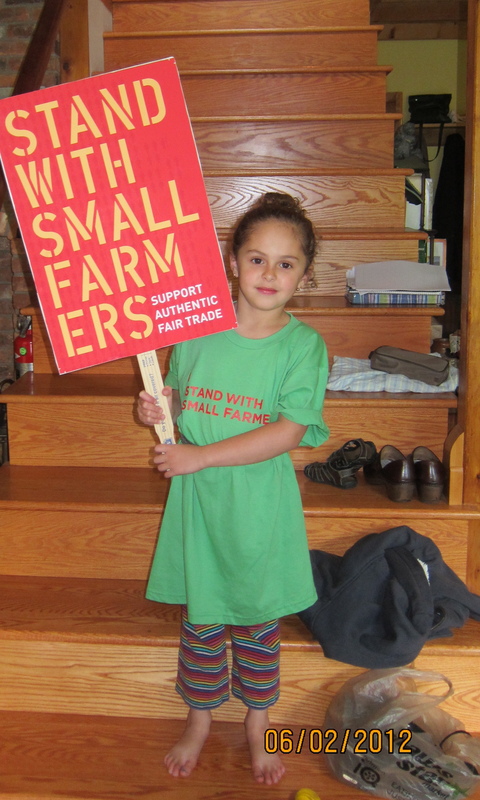 This is a time of many changes in Fair Trade that affect the survival and future of small farmers. Large scale private owned plantations are harmful to small producer organizations (SPO) in many ways, as they generate unfair competition. First, by affecting sustainable prices (they have lower costs, more access to information, finance, technology, logistics, etc.). As an example we can mention bananas, the minimum Fair Trade price which was settled on is NOT sustainable for small farmers and their organizations because it was a compromise between what a plantation needs, a SPO needs, and the market; the outcome favors markets and plantations. Unfair competition is also the outcome of a lack of commitment in the industry: it is a lot easier, cheaper, faster and safer to buy from the big estates. Then, you have unfair competition in raising standards: when you have plantations in a crop, just to make it look more ethical, Fair Trade raises the labor standards and the consumer and media assume that these standards apply also to SPOs since we all use labor in agriculture.In bananas, they check us more on labor, threatening small farmers as well as wealthy employers, without caring any more about their miserable and difficult lives, affected by low prices, lower volumes (because of low prices they can invest less in production and productivity falls), high costs and climate change damages. Labor standards, environmental standards, and high conditions on food safety and infrastructure, all as a result of and to justify the existence of plantations in the system, are pushing small farmers out of Fair Trade. The last tendency will be the Unions fighting for workers, as they are considered to be the poorest of the poorest; nobody cares anymore about small farmers, whose incomes are far below workers’ income, with no protection through any laws, no social security, no pension funds, no protection against climate change and no guarantee of markets. Plantations in Fair Trade did not enter to solve poor working conditions, rather, they entered to serve the market faster and cheaper. They create unfair competition in Fair Trade, and will change the direction of Fair Trade to a charity movement and not a movement that supports farmers through empowerment and progress thanks to stable markets and sustainable prices; a movement that enables farmers to create progress through their own efforts and work. As the Latin American and Caribbean Network of Small Producers (CLAC), it is our mission and responsibility to represent the small farmer; sometimes the system even questions our commitment and considers us to not be inclusive. Perhaps the current changes are seen as positive by consumers and the Fair Trade world, but they will exclude once and for all small farmers if we do not make the right decisions; if this happens, once again we will stop local community development and negatively impact good environmental practices: the market will win but the world will lose a unique system able to create change working with small organized farmers. The Fairtrade certified coffee producers in Brazil is writing this letter to express our dissatisfaction with the changes that are deploying Fair Trade USA since late 2011, and for entry and certification of large individual farms of coffee. It is with great concern that we observe the commitment of the Fair Trade USA to promote the product from large farms, on the grounds of wanting to bring the benefits of Fair Trade label workers on large farms. We understand the great challenges facing the market and the current needs of the growing Fair Trade label. But consider that there are many other alternatives to achieve this goal without jeopardizing smallholder farmers. The system of large-scale production is one factor that makes the highly competitive large farms with low production costs and the ability to offer coffee at low prices in the market, becoming a major threat to small producers, Fairtrade label. Another factor is that large farms are already holding other certifications that already guarantee that your product has a large percentage of the market, so the Fairtrade seal for them would be unnecessary. The family farm, according to the IBGE 2006 census, produces approximately 34% of coffee from Brazil, worked by landowners and by partners and tenants. According to the Brazilian reality, only 1% of this total has been certified to Fairtrade label, which currently has 6,000 families and involved some 24,000 workers directly benefit from, promoting local development, improve the quality of life of the producer in its surroundings, and posting financial resources in their region. Being a high probability of growth with small producers in Brazil. The Fairtrade certification organizations of small producers has shown its benefits to the community in recent years. The distribution of revenue from the sale of Fairtrade-labeled coffee, among owners of small properties, partners, tenants and workers has boosted the region and developed areas in the environmental, health, education and quality of life, thanks to the aggregation of turnover values and with the investment of the award. Instead, the certification of large individual farms concentrates proceeds from the sale of coffee in a single owner and no longer in the hands of a few workers. In our view, these changes threaten the most precious value of a family farmer: Being the owner of his own land, enhancing the fruit of your work, keep your family around a single ideal and food stamp along with the dreams and ideals producing property and quality of life. The professionalization of the small producer is also helping to maintain our youth in the region, managing small agricultural enterprises and participating in associations and cooperatives. When we manifest our dislike and disgust with the current design of the Fair Trade USA, we would like to make clear, the appreciation and respect we have always had for your organization. We are grateful to FAIR TRADE USA for work, that was developed with us small coffee producers, adding their efforts and resources in partnership with other organizations in our development and growth. Given the potential growth of family farming in Brazil, we recommend that efforts and investments are Fairtrade USA in expanding the Fairtrade seal for family farmers are not yet certified. BR Fair – Fairtrade Association Representative Groups of Brazil, is positioned against the certification of large individual farms, because it represents, defends and ensures that the Fairtrade seal in Brazil never lost its essence, it is the only certification in the world allows families of small producers to market fairly the fruits of his labor. Dole Food Co. (DOLE), Fresh Del Monte Produce Inc. (FDP) and Dow Chemical Co. (DOW) were sued by more than 1,000 banana plantation workers from Costa Rica, Ecuador and Panama in a new round of cases claiming injury from a pesticide. Read more here. Would You Like a Little Pesticides with Your Bananas? “Bananas” a musical journey from Selva Rica on Vimeo.